Location: On the south side of Hutton Lane close to its junction with The Avenue and Hutton Village Road and on the east side of the access road to Hutton Hall. The Guisborough Walkway follows the track east from the station. 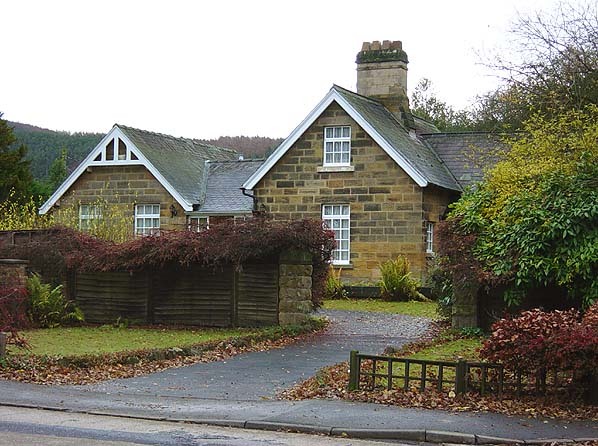 The station buildings are now a private house. Single post from crossing gates still exists and the platform extensions thought to be from 1904 can be seen. Short sections of the original lower platforms also remain. A private house occupies the site of the siding. Notes: The station opened in c.1867 adjacent to Hutton Hall newly built for Sir Joseph Whitwell Pease (Chairman of the North Eastern Railway). The new station was a private station for the use of the Pease family. The station closed on 1st October 1903 reopening on 1st January 1904 as a public station. At this time the platforms were lengthened, the additional sections of platform being at a slightly higher level. 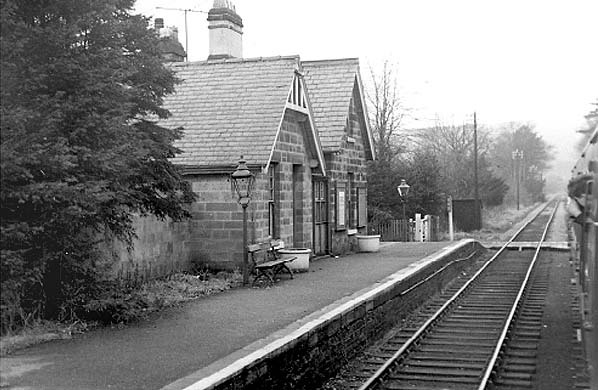 The station was unstaffed from 11th November 1961. 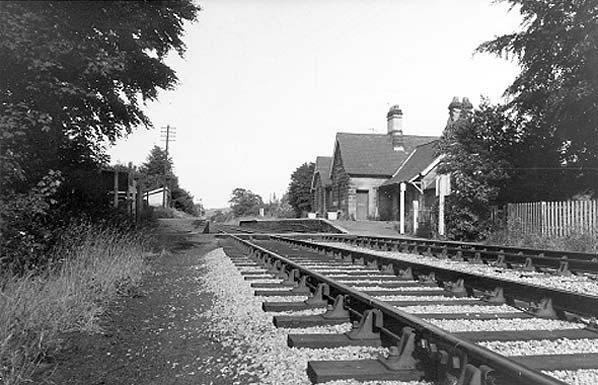 Although the station didn't handle freight traffic there was a level crossing and short siding to the west of the station which is said to have been used for timber traffic. In 1907 the new Belmont mineral line branched from the up line immediately to the east of the station. This branch was closed in 1921. The Stockton and Darlington railway, opened in 1825, had established good connections with the coalfields and the iron works at Witton Park in the west. It reached Middlesbrough in the east in 1830 and established a dock there. A new town was born which was to become a centre for iron making to support the industrial development which was gripping the country at the time. In July 1850 good quality ironstone was discovered at Eston. Ironstone of similar quality was also discovered in large quantities at Guisborough, Skelton, Loftus and Skinningrove. Soon the mineral rights had been let by the major landowners and a decent railway system was needed to transport the stone to the blast furnaces which were being established on both banks of the Tees. Mr Joseph Pease and his son Joseph Whitwell Pease who were influential in the Stockton and Darlington Railway Company had taken the mineral rights at Codhill, Hutton Lowcross near Guisborough. A railway was needed to transport the ironstone to feed the developing furnaces in Middlesbrough. The Stockton and Darlington Railway saw this as an opportunity to establish a monopoly position in Cleveland whereby all ironstone being transported west out of the area would be along the proposed new railway or by the Eston branch which had been transporting ironstone since January 1851.
from the south side of the valley to the blast furnaces in Middlesbrough. The locals were not happy about a railway bearing the town’s name stopping short of the town so a petition was organised resulting in the proposed railway being deviated and extended to terminate in the town. The Act of Parliament for construction of the line was passed in 1852 and it was opened, as a single line, for mineral traffic on 1st November 1853. The first passenger service, one daily journey each way was provided from 25th February 1854. The line was doubled soon after opening. It ran independently until 5th February 1857 when it became a constituent of the Stockton and Darlington Railway and then in 1863 part of the North Eastern Railway. By the time the line became part of the S & D the spelling of Guisborough had changed. The line branched from the Middlesbrough and Redcar Railway, which had been opened in 1846, at Guisborough Junction, Middlesbrough. From here it took a generally southerly route, first calling at Ormesby. 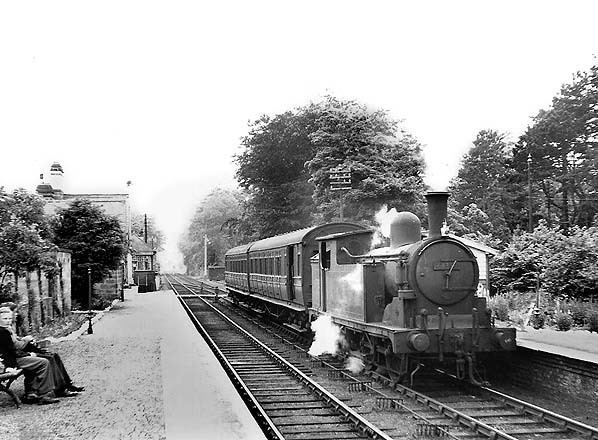 Thereafter there was a steep climb of 1 in 44 for 1½ miles before entering Nunthorpe station. A new halt, Gypsy Lane, to serve the expanding residential areas of Nunthorpe was opened between Ormesby and Nunthorpe on 3rd May 1976. From Nunthorpe the line curved to take an easterly course to skirt the southern side of the valley between the Eston and Cleveland Hills. The mining of iron stone around Hutton Lowcross by the Peases operated from 1852 but by 1867 the Codhill and Hutton mines had closed. The family had increased their holdings in the area and developed their use of the surface land. Sir Joseph Whitwell Pease who eventually became chairman of the North Eastern Railway commissioned the design of a large house, Hutton Hall, which was completed in 1867 and a private railway station, Hutton Gate, opened around the same time, was built close by for the use of the Pease family. A short distance to the east and by the old road to Hutton, adjacent to High Cliff School, another station is said to have been in existence. In 1861 it was also known as Hutton Gate station and said to have been closed when the private Hutton Gate station was opened in 1865. However the censuses suggest that the old public station survived for some time afterwards and perhaps until the private Hutton Gate station was opened as a public station in 1904. From here the line continued into Guisborough station, a terminus situated to the south of the town centre. Guisborough is also a public footpath and this has recently been extended along the old Cleveland Railway towards Slapewath. The closure of the Middlesbrough to Nunthorpe Junction section of the line was rapid. Proposal for closure was made on 14th June 1963, a public enquiry was held in Middlesbrough on 23rd August 1963 and consent for closure was given on 27th November 1963. The date of closure was announced on 13th February 1964, the last passenger train ran on 29th of the same month and the line was closed to passengers from 2nd March 1964. The goods service to Guisborough ceased on 31st August 1964. The remainder of the line from Middlesbrough is still open to Battersby and forms part of the Esk Valley Line. The 2.5 mile Guisborough Walkway follows the railway for much of its course. To see other stations on the Middlesborough & Guisborough Railway click on the station name: Pinchingthorpe (1st Station), Pinchinthorpe (2nd Station), Hutton, Hutton Junction & Guisborough. when the station became unstaffed. Looking east from Hutton Gate Station in November 2007. The Guisborough Walkway leaves the course of the railway at the station. The trackbed is fenced across behind the photographer and is private property.